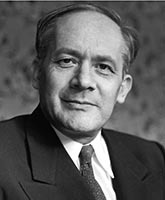 Raphael Lemkin was born in 1900 in a village called Bezwodne which is now a small town in Belarus. After qualifying as a lawyer, his first professional appointment was as Secretary to the Court of Appeal in Warsaw where he later became a public prosecutor. Following the commencement of the Second World War, he participated, as a member of the Polish Army, in the unsuccessful defence of Warsaw. He managed to avoid capture by the Germans and travelled to Sweden where he lectured at the University of Stockholm. He then gained permission to enter the United States, arriving in 1941. Dr Lemkin held professorships at the University of Stockholm in Sweden and at the American universities of Duke, Yale and Princeton. He was an adviser to Justice Robert Jackson at the Nuremberg trial. He published a number of substantial books during the course of his career including Axis Rule in Occupied Europe in which he, for the first time, used the term "genocide", with which he is particularly associated. He defined "genocide" as "the destruction of a nation or an ethnic group". This term was incorporated into the United Nations Convention on the Prevention and Punishment of Genocide in 1948, which he drafted. Dr Lemkin lost 49 members of his family in the Holocaust. He succeeded in introducing the crucial concept ‘genocide’ as an international crime. According to reporters who went looking for him to share his triumph after the adoption of the UN Genocide Convention, they found him in a darkened room weeping in solitude. He received the Stephen Wise Award of the American Jewish Congress in 1951 in recognition of his contribution to international law and was nominated for the Nobel Peace Prize by Winston Churchill in 1950 and 1952. In 1989 he was posthumously awarded the Roosevelt Freedom Medal for his enduring contribution to the principle of freedom of worship. Nominated by Baris Anil, CPE Part Time Year 2 and Carol Jacobs LLB, Graduate and chosen for the Inspired by Law gallery of lawyers and legal campaigners in 2015. Photo provided by Alamy. Copyright Alamy.